This page covers the mods and changes I’ve made to my Vintage VH51FR guitar. What’s one of those? 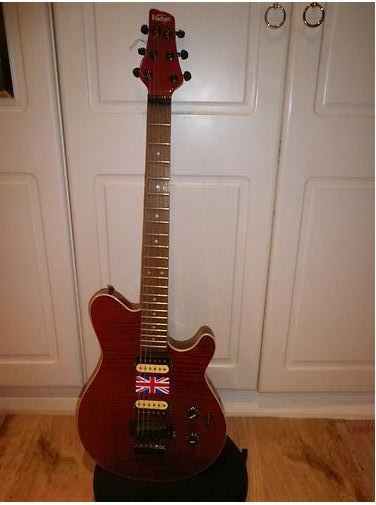 It’s a guitar that’s somewhere like a MusicMan Axis Sport/Eddie Van Halen and Peavey Wolfgang. It’s a sort of modern take on a twin humbucker, Floyd Rose rock guitar I guess. It’s made somewhere in the Far East and is branded in the UK as a “Vintage”. I guess the VH in the type is for “Van Halen” and the FR is for “Flamed Red” which is what it is. Dunno what the 51 stands for. So I fired in a bid. And I won. And it cost less than £50.00. Yep, the decimal point is in the right place. I didn’t know what to expect as I’d never even played a guitar like this, never mind owned one and there’s not a lot of information about them available on the web. But I was happy that if I didn’t like it I could always put it back on ebay again and possibly even make a small profit. And so it arrived. First things first………. the Union Flag had to go….. Sorry but it did.